The Infinite Winter Horizon Trap is a Limited Edition Arcane weapon. The centre of this Horizon Trap is a glowing portal full of winter wonder. Each mouse caught within its gravitational pull get sucked into its centre and whisked away into its own snow galaxy, an entire galaxy consisting of only a single house and perpetual snow. Like a snow globe! Forever! The Infinite Winter Horizon Trap is not sold by any Trapsmith. It can only be crafted given the proper ingredients. The Infinite Winter Horizon Trap acquires a 20% Power Bonus when armed with Snowball Charms. Smashing this weapon with the Hunter's Hammer yields Frozen Galaxy Event Horizon Module and Event Horizon Trap Parts. 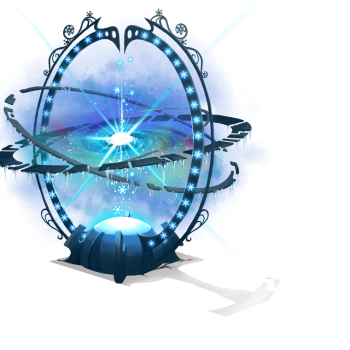 12 December 2017: The Infinite Winter Horizon Trap was introduced as part of the Great Winter Hunt 2017 with the release of the Frozen Galaxy Event Horizon Module. This page was last edited on 27 January 2019, at 01:39.